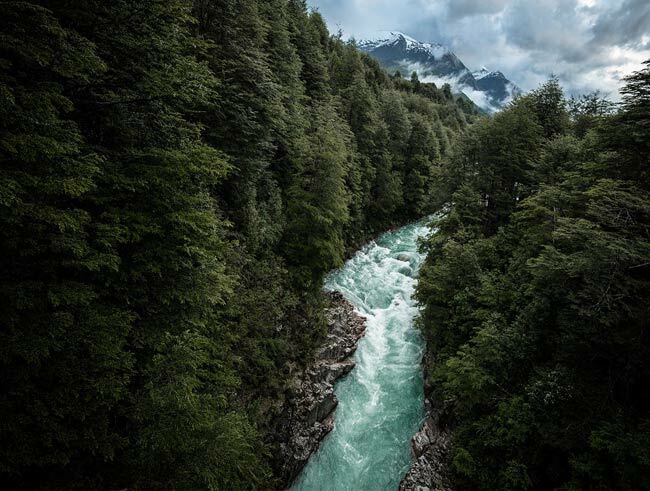 The Futaleufu carves through the Andes on its way to Yelcho Lake. 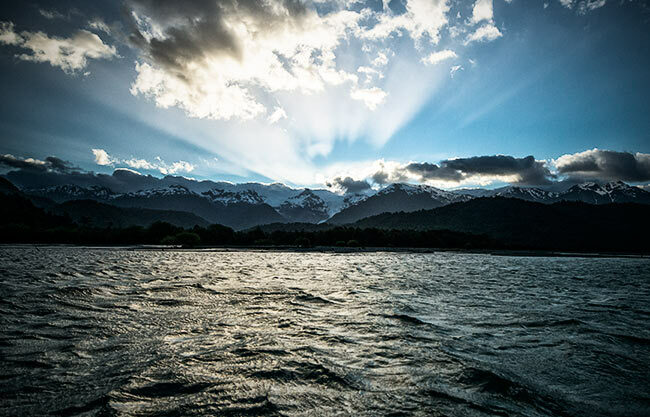 Last month I was invited on a media trip to Patagonia–Chilean Patagonia to be exact. Shortly before the trip a student of mine at the University of Michigan was wearing a Patagonia-the-brand ball cap (to be fair, about 30% of the Ann Arbor population has the word emblazoned somewhere on their person). I pointed to her hat and mentioned I would be heading down there in a week’s time. She looked ill at ease for a few moments as she processed this. 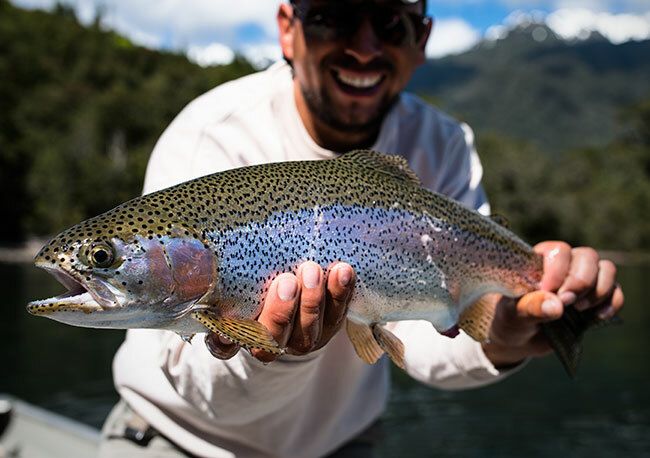 I’m here to report that yes, despite appearing far more often on bucket lists and jackets than actual travel itineraries, Patagonia is real, wondrously real, and definitely deserving of the serious angler’s attention. My trip went down in early December, early June by Patagonia’s meteorological standards. After layovers in Miami and Buenos Aires, I arrived by plane to the Argentine town of Esquel. It was windy. Really windy. The plane shuddered mightily during the descent, and upon landing I realized that I had unconsciously triple-knotted the sleeves of my sweatshirt around my waist. I heard the voice of a friend as we discussed what gear I’d need for the trip: “Got Patagonia? Got wind.” He was right. Sunset on Yelcho Lake after a long day of throwing dragonflies. Patagonia, I learned from my hosts, the good folks at Yelcho en la Patagonia, comes in two flavors: green and brown. Put another way, there’s Chilean and Argentinian Patagonia. I landed in the brown, desert-scrub Argentinian side, but as we crossed through the Andes into Chile things got greener—and wetter—in a hurry. New landscapes emerge in our perception by comparison to ones we already know. During the three hour drive to the lodge on Yelcho Lake, I saw emerald, sheep-filled pastures that reminded me of Wisconsin’s Driftless region. The deep ranches and attendant cattle of Montana. The green, snow-capped mountains of the Pacific Northwest. And then there were things more uniquely Patagonian: huge fronded ferns flanking glacial trails. Gauchos on horseback, each trailed by a small white dog. At sunset we arrived at our destination of Yelcho lake, a massive purple mirror in the dusky snow-capped mountains. On one end, the lake receives one of the world’s most awesome undamned rivers, the Futaleufu; on the other it sends water down to the Pacific ocean via the Yelcho River. For this reason the fishery is about as diverse as can be, with resident brook trout, browns and rainbows cavorting with seasonal Chinook, even the odd resident Atlantic. But who wants to hear about sunsets and car rides? Or glaciers or wine? 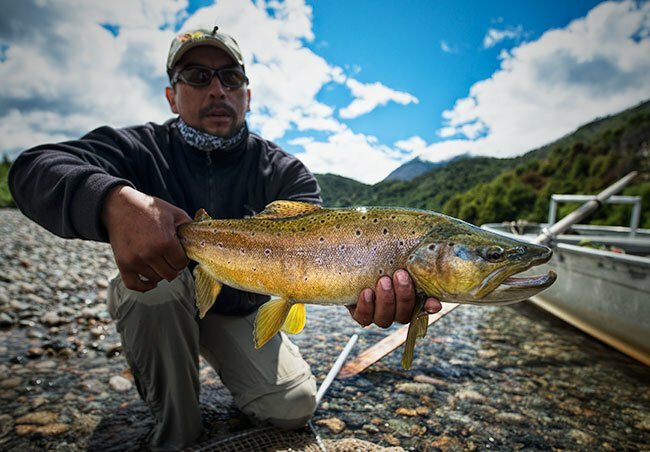 Here’s what the Patagonian piscator can expect from a week in lush green Chile. Prior to the trip, most of my trout fishing had been done in rivers, and I wondered if on the lake I’d get bored with what I expected to be a more basic version of fly fishing. I was afraid of it being too easy. This proved to be absolutely not the case. If the water in the lake isn’t moving, the fish and wind sure are. For a week straight, I had phenomenal—and satisfying—flats-style fishing. Only we weren’t throwing crabs and clousers. We were throwing huge attractors and size 2 extended-body dragonflies. It’s the latter bug, the dragonfly, that provides arguably the biggest draw to Yelcho Lake. Put simply, if you have sunshine—which, with a rainforest climate similar to the Pacific Northwest, is not necessarily a daily occurence—you have dragonflies. With the sunshine and dragonflies come wind, and you don’t need to watch these prehistoric bugs for too long before realizing that in order to avoid getting updrafted into the firmament these ultra-bouyant aircraft need to fly as low to the water as possible. That is, until it they get snatched up by browns and rainbows that have evolved to gnash on them. Which seemed, by the looks of all the fish leaping out of the lake, pretty much all of them. Head guide Nancho Suazo with a dry-fly rainbow. The dragonfly game is a little bit like wack-a-mole: see a fish breach and cast your dragonfly right where the fish’s head went back down. Don’t lay your fly line leader over the fish. Also, since you’re on still water, you’ll want to get rid of that otherwise very useful S-curve. With water the color of Sapphire gin, you want as much distance as possible between your fly and your fly line. When the dragonflies aren’t happening, or when they’re at a lull, the next best fat-fly game is throwing terrestrials at rainbows cruising the weed-eges and drop offs. This is exciting fishing: to watch a chrome ghost in the 20 to 24-inch class rippling below the surface of the turquiose water, to put a fly through stiff wind into its path, to watch your quarry twitch with recognition, gently alter its course and open its cottony white mouth. Bam. It’s on. But the dry fly fishing isn’t all stiff wind, big flies, and 2x. There’s also stiff wind, tiny flies, and 5x. The scumlines that form in the large eddies at the mouth of the Yelcho River attract a population of particularly mean-spirited 18-20 inch fish, each of them a challenge with size 18 dries, light tippet, and a wonderland of timber directly below the boat. The challenge here is intercepting fish as they move between shifting scumlines, and achieving drag-free drifts in the shifting, roiling surface currents of the eddy. For this fishing, I recommend choosing the reel whose sound you like the best: it’s going to scream at you all day. One of many Patagonia browns that sharked down a Michigan streamer. If you’re a streamer junkie, prepare for Valhalla. There’s lake fishing to palaces of sunken timber on Yelcho Lake, river mouth fishing at the mouth of the Futaleufu, and straight-up river fishing on the Yelcho and middle Futa. Each fishery comes with its own challenges, cadences and rewards. The delta was a vast expanse curving sandbar falling straight down into the green-blue depths. Hefty browns would sit with their chins on the edges like a dog at the dinner table. Catching them was a matter of bringing the streamer across their field of vision without spooking them, and watching them shark across the flat to hit it. It was the the most visual streamer game I’d ever experienced. The Yelcho River alternates between timber-stacked cutbanks and sheer rocky cliffs; the channels are lovely, dark and deep. You’ll find browns in the wood and rainbows in the rocks. Adjust your presentations accordingly. A rainbow is going to be less susceptible to a reactionary, territory-defending fight. On a given day, the competent streamer angler can expect to pull plenty 18-20 inch fish, a handful of low to mid-20s fish and get a few cracks at bona fide donkeys from some of the most beautiful lies on earth (I left the rivers pretty sure that this was where brown and rainbow trout, if they’ve been good, go after they die). 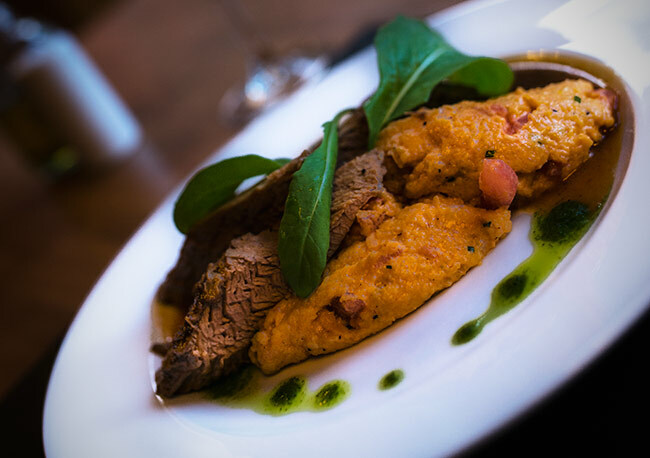 Braised beef and pumpkin puree. Preceded by shrimp scampi with hearts of palm. Followed by creme brûlée and fresh fruit. Anglers are prone to exaggeration. And I just wrote a piece on lying to tell the truth. For that reason I want to call extra attention to the standard-issue truth in the following statement: the food was superb. Fresh seafood and fresh steaks, whole lamb grilled on a cross-iron spit over hot coals, fresh vegetables and local beer and wine. For lunch, you can elect to motor back to the lodge for a proper meal, or eat picnic style on the beach if you want to keep fishing as much as possible. I had to check the mirror occasionally to make sure I was still some dude from the Midwest and not the King of Persia. Did Patagonia sate me? Absolutely not. I fished for my own personal best 13 days in a row and even then had to be removed from the boat with a spatula. I started texting friends from my first layover in Buenos Aires. (“Anyone want to go fishing this week?” “Uh, it’s Christmas, Dave”). Good fishing sates me. Great fishing turns me into another animal that wants to stay in that high gear for as long as possible. For the right angler at the right time in their career, Patagonia can be that place, Patagonia can do that thing. Go there not to get your scratch on, but to open up a whole new world of itch. 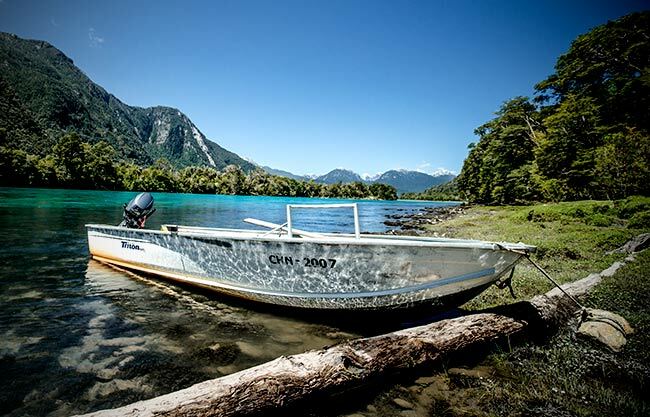 To learn more about fishing the lakes, lagoons and rivers of Chile’s remote Northern Patagonia, visit the crew at Yelcho en la Patagonia at www.yelcho.cl.